Generally, when I think of people with trust funds, I think of elderly gentlemen smoking cigars and drinking chardonnay behind a desk made of mahogany in an office the size of a small apartment. Betterment is out to put an end to that stereotype and prove that with the right tools, anyone can access the benefits that a trust account can give, plus more. As legal documents or entities that hold property and/or assets for the people who create them, trust accounts are important tools during estate planning. The person setting up the account is called a grantor, donor, or settler, the person or entity managing the trust is called the trustee, and the individual(s) who will ultimately benefit from the trust are called beneficiaries. Sometimes, the grantor, trustee, and beneficiary are all the same person. There are a number of reasons individuals may choose to open trust funds. Perhaps one of the most widely recognized reasons for opening a trust is when wealthy parents are providing for minors or other family members who are inexperienced or otherwise unable to handle financial matters. But people who want to be sure their personal assets are managed if they can no longer handle them themselves may also choose to set up a trust. Such an account will also reduce taxes and provide liquid assets to help pay for estate taxes. Trusts provide opportunities to avoid probate and quickly transfer assets to the beneficiaries upon the grantor’s death. They are often chosen over wills because the terms of a will are public, whereas the terms of trust funds are private. Betterment offers a simple signup – setting up a trust is quick and can be done entirely online. Cash flow management is easy with Betterment, because every deposit and paid dividend is used to automatically rebalance your portfolio, which can minimize taxes. Once you’re signed up, Betterment invests your trust account in a risk-adjusted, globally diversified portfolio of low-cost exchange traded funds (ETFs). With Betterment, you’re in control. You can create unique goals for each beneficiary, automate money transfers for beneficiaries on a custom schedule, and manage different trust accounts with a single login. You’ll have online access to account activity, quarterly statements, and annual tax forms and be able to view performance graphing and visualization tools to understand the long-term potential returns of your trust. Betterment’s transparent policy means your portfolio is fully visible to you, and you’ll be given the reasoning behind each stock that your assets are invested into. Behind Betterment’s exquisite performance is intelligent and intentional software and design. To provide users with maximum efficiency, Betterment offers automated deposits so you can easily make deposits into your account. Betterment recommends that you set up the deposits to occur the first business day after your paycheck is deposited. That way, you won’t accidentally spend it. With the fractional share feature, Betterment ensures that every customer, even those in the early accumulation phase, can fully benefit from options like tax loss harvesting. You’ll experience firsthand why Betterment is known for its award-winning service when you open a trust fund. With one-click deposits and withdrawals, electronic deposits from your bank to Betterment should invest the following business day. Also, Betterment has better hours than a bank – you don’t have to rush out of work early to make it before it closes, because your account will be waiting for you at your computer at home. Betterment works around the clock to streamline your service and efficiently communicate with your bank so you don’t have to. You can even cancel a deposit directly on the Transfer page of your Betterment account. When it comes to creating a personalized strategy for each of your life goals, Betterment understands that your investment should accommodate you – not the other way around. Once they understand your goals, they’ll work with you and give you advice in order to create a customized portfolio that is adjusted to fit your unique situation in life. By making sure your portfolio is properly risk-adjusted, Betterment puts you in a position to receive the optimal returns on your investments, which means you’ll meet your life goals faster. All the features Betterment offers aren’t by accident. Betterment’s leadership brings decades of industry expertise in driving their investment approach. Basically, they know what investors want and are eager to make sure the best investing experience – whether it’s for retirement, an IRA, or a trust fund – is delivered to the customer. 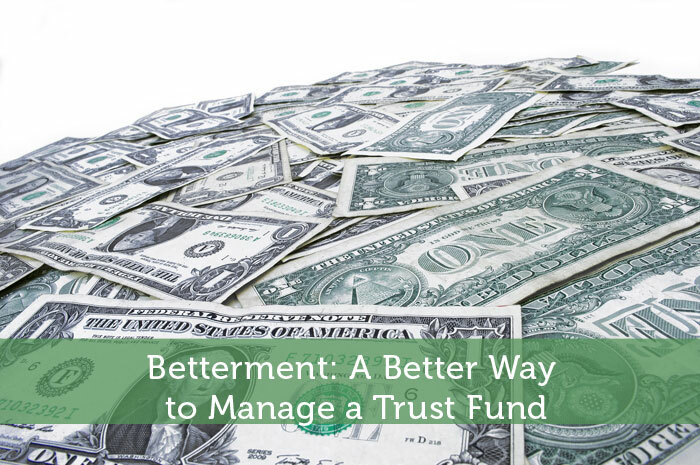 With Betterment, opening a trust fund is right at your fingertips. There’s no better time to open a trust fund than right now, and with Betterment, the process couldn’t be easier. So sit back, relax, and get started with Betterment today. Maybe even pour yourself a glass of chardonnay while you’re at it. Betterment just keeps getting better. I love using them for my taxable investing and it seems like every month they are adding more and more features and products. Definitely worth checking out!